Apple shipped some 29 million iPhone X units in the last quarter of 2018, according to fresh estimates from Canalys, making it the best-shipping smartphone for the period. According to the market research firm, iPhone X adoption was fueled by strong upgrade demand in markets with already high iPhone install bases. These regions are often characterized by dominant cellular carriers capable of offering financing options to alleviate out-the-door customer costs, an important consideration for a handset that starts at $999. Canalys estimates an impressive 7 million iPhone X shipments went to China. 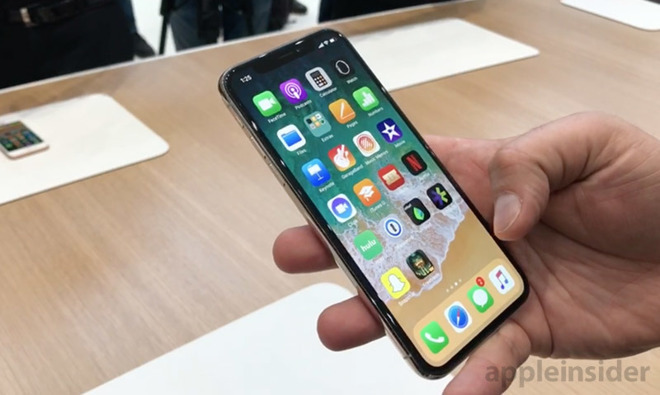 Some analysts expect Apple to report slow iPhone X uptake in China due to the handset's high price tag, though data collected by others, like RBC Capital Markets' Amit Daryanani, show heightened interest in the premium device. To put the Canalys numbers into perspective, Apple shipped a record 78.3 million iPhones over the holiday quarter in 2016, and another 46.7 million units last quarter. "One major benefit to Apple is that customers are increasingly realizing the residual value of their old smartphones, opting for trade-in programs to offset the high price of the iPhone X," said Canalys analyst Ben Stanton. "But that big price tag, and Apple's split launch strategy, still had an impact, and shipments were not the fastest ever for an iPhone." While the firm failed to provide specific figures, it said the iPhone 8 series and older hardware like the iPhone SE, 6s, 7 also shipped well in the last calendar quarter of 2017. As expected, price was a determining factor in moving iPhone models below iPhone X. Today's estimates follow a Kantar Worldpanel report that earlier this month claimed iPhone X sales topped smartphone sales charts in Japan and Great Britain in November. The top-tier model was surpassed by the iPhone 8 in the U.S., and captured only 6 percent of the urban China market over the same period, Kantar said. Apple put iPhone X up for preorder in October ahead of a launch in early November. Initial supply was quickly depleted as customers saw their delivery dates pushed out to over one month. Apple only recently reached supply and demand equilibrium in mid-December, meaning the final quarterly tally could be lower than some anticipate. Apple is expected to offer a glimpse into iPhone X sales metrics when it reports earnings for the first fiscal quarter of 2018 next month. The company typically declines to break out numbers on a per device basis, however, meaning investors are unlikely to receive definitive data on iPhone mix.